Korematsu v. United States challenged the US government's power to impose Executive Order 9066. 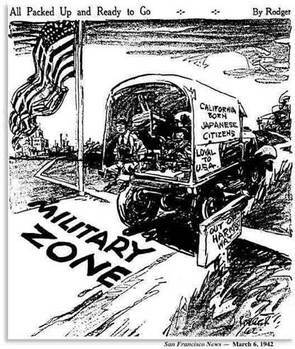 Even though the United States was also at war with both Germany and Italy at the time, only Japanese Americans, regardless of their citizenship, were forced to report to Internment Camps. Korematsu argued that Executive Order 9066 was a violation of his constitutional rights. Although Executive Order 9066 was issued based on “military necessity”, the government never examined whether this massive imprisonment of an entire ethnic group was justified. The government is responsible for making decisions based on facts, not the fear of espionage. Justice Murphy, dissenting, wrote “President must be reminded that they too have to subject to the law and the law must insist and law must be obeyed.” The US government failed in its responsibility of safeguarding Constitutional rights during the war time. The court accepted the government’s representation of Korematsu's case and chose to ignore reviewing the factual basis for military decisions in wartime. “The judicial process was seriously impaired when the government’s law enforcement officers violate their ethical obligations to the court. The court is not powerless to correct its own records where a fraud has been worked upon it or where manifest injustice has been done," according to Judge Marilyn Patel. It is essential to maintain a proper balance between civil liberties and protecting national security, especially during wartime.